Trevor Hicks, Washington High School senior, signs a letter of intent to attend Robert Morris University (in Pittsburgh) Wednesday morning. In front, (l-r); Barbara Dean, Hicks’ grandmother; mom Dinah, Hicks and his dad, Roger, and in back, l-r); his uncle, Tom Dean, Blue Lion head football coach Chuck Williamson and athletic director, Jon Creamer. Trevor Hicks remembers quite vividly the first varsity football game he played and getting his first quarterback sack against the Circleville Tigers. Hicks, a senior at Washington High School, took a big step toward the next chapter in his life when he signed a letter of intent to attend Robert Morris University, where he will study criminal justice and play on the offensive line for the Colonials. Hicks signed his letter in a ceremony before a gathering of family, friends, teammates and coaches Wednesday morning. “Robert Morris offered me last April,” Hicks said. “What I figured out is, family means everything to them. From the get-go, they fell in love with me as I did with them. The Colonials compete in the Northeast Conference, which for football includes Duquesne, Cent. Connecticut, Saint Francis (Pa.), Sacred Heart, Mount Saint Mary’s, Wagner and Bryant. “Academically, they have a good criminal justice program,” Hicks said. “I haven’t really decided what field in that area to go into, but, definitely criminal justice. 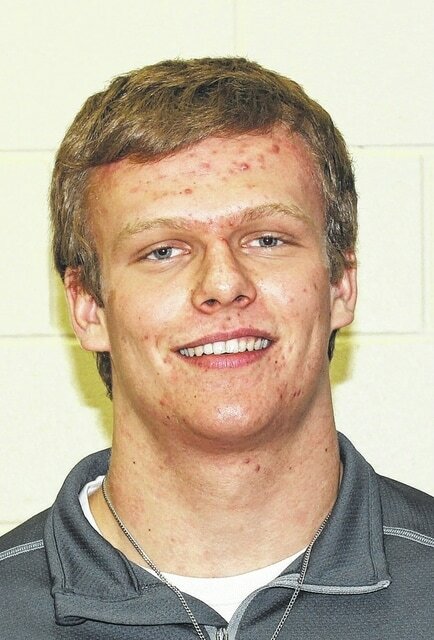 “I also had an offer from Tiffin University, Duquesne, Toledo and a preferred walk-on at Ohio State,” Hicks said. “It was a process of figuring out what’s right, how it benefits my family. “Robert Morris treated my family well,” Hicks said. “I remember the second time I met them, after six months of not seeing them, they knew my mom and my uncle by name when they went there. That was definitely a good moment. One of Hicks’ favorite subjects in high school was U.S. History. “Mr. (Ryan) Day had a really good class,” Hicks said. “Trevor has been a pleasure to coach,” Washington head football coach Chuck Williamson said. “He gets it. He’s going to be a tremendous college football player. He was an unbelievable high school football player. The sky’s the limit for Trevor. He’s just an unbelievable talent. “Trevor was our left offensive tackle,” Williamson said. “But, we did have some packages where he could play on the defensive line. If the game was on the line, he was one of our best football players and he would be in the game at that point. “He actually got offered as a preferred walk-on at Ohio State as a defensive lineman,” Williamson said. “That shows you his versatility and that he can do it all. He’s a complete player. “I definitely want to thank my family for all of the love and support they’ve given me throughout the years,” Hicks said. “Especially my mom, for everything she’s done for me. I’d like to thank my grandpa (Chester Dean). He passed away last May. He helped out with a lot of everything I do. He really helped me with this decision. He’d definitely be the proudest person if he were here today. “I want to thank all my coaches for everything they’ve done, especially coach Williamson,” Hicks said. “He definitely turned this program around when he walked in. I knew when I met him great things were going to happen. The next thing you know, we have our first winning season in six years (going 7-3). “I couldn’t have asked for a better staff than he brought with him,” Hicks said. “Especially coach (Bob) Wolfe and coach (Kevin) Hyme. They definitely developed me into the football player I am today. Also, all the students and players, they supported me all the way through this process and brought out the best in me. What about a favorite moment or moments playing football at Washington? “Probably my favorite moment was my sophomore year, my first-ever varsity start,” Hicks said. “Walking out onto the field was definitely a big moment. I remember I made my first sack against Circleville and I remember looking up into the stands and seeing people going crazy. It was definitely a great moment. 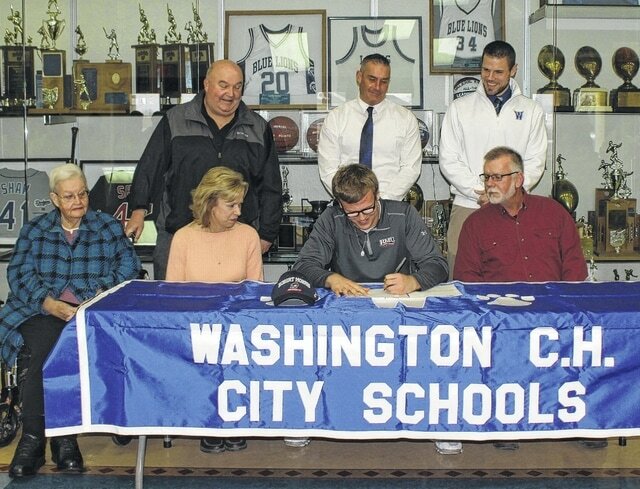 https://www.recordherald.com/wp-content/uploads/sites/27/2017/02/web1_Trevor-Hicks-sign-pic.jpgTrevor Hicks, Washington High School senior, signs a letter of intent to attend Robert Morris University (in Pittsburgh) Wednesday morning. In front, (l-r); Barbara Dean, Hicks’ grandmother; mom Dinah, Hicks and his dad, Roger, and in back, l-r); his uncle, Tom Dean, Blue Lion head football coach Chuck Williamson and athletic director, Jon Creamer.